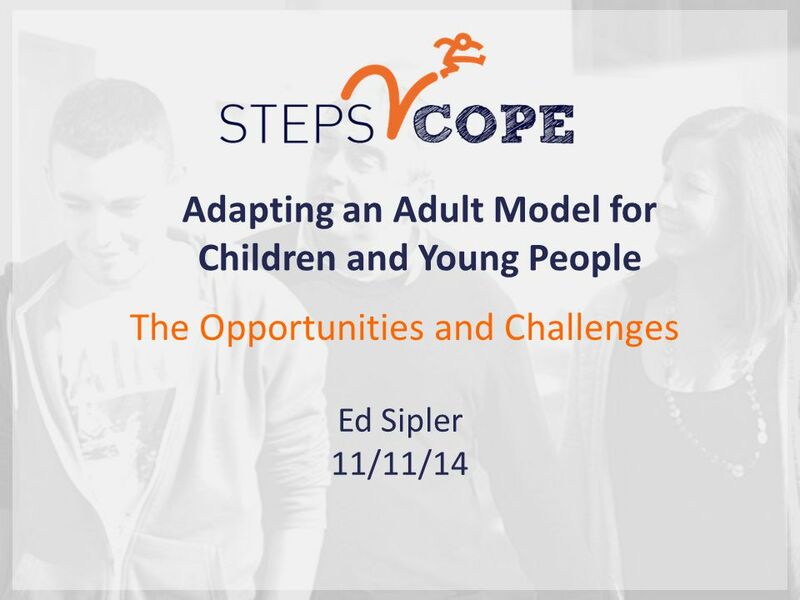 The Opportunities and Challenges Ed Sipler 11/11/14 Adapting an Adult Model for Children and Young People. 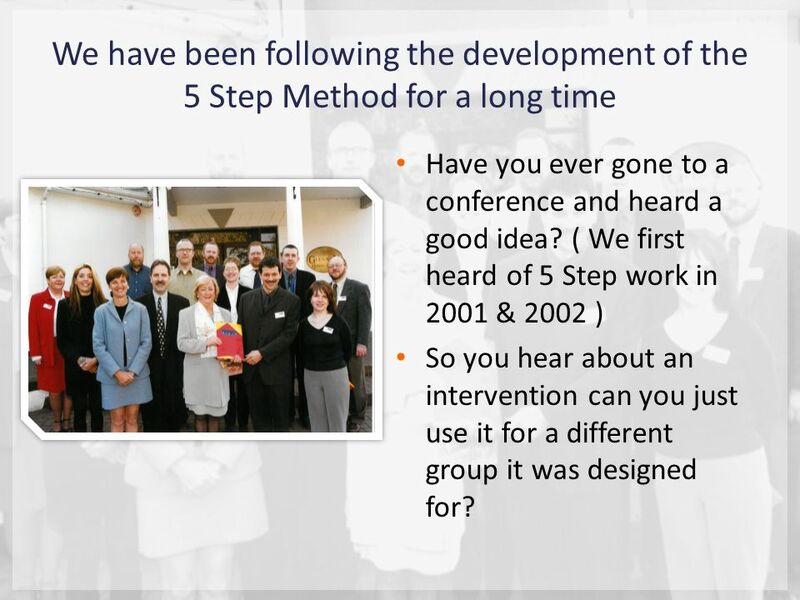 2 We have been following the development of the 5 Step Method for a long time Have you ever gone to a conference and heard a good idea? 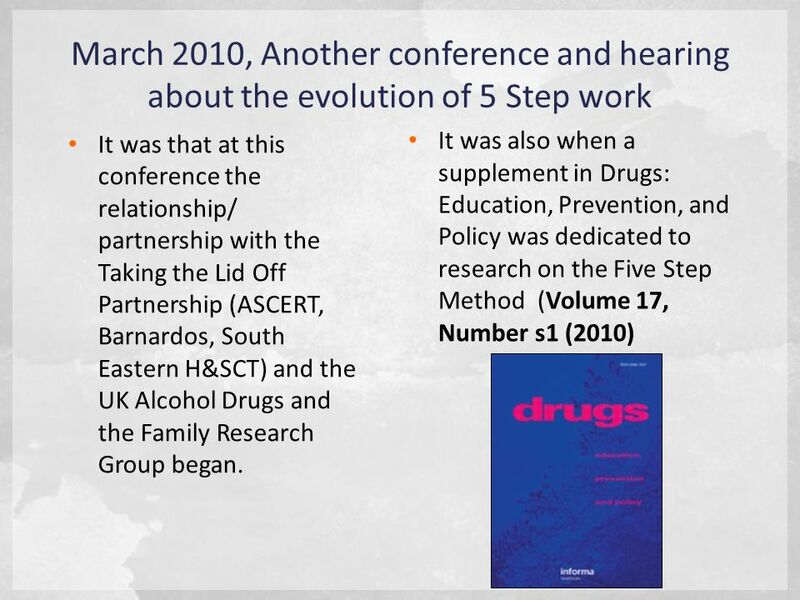 ( We first heard of 5 Step work in 2001 & 2002 ) So you hear about an intervention can you just use it for a different group it was designed for? 6 ‘I felt sad and angry. I used to cry at night in bed on my own. 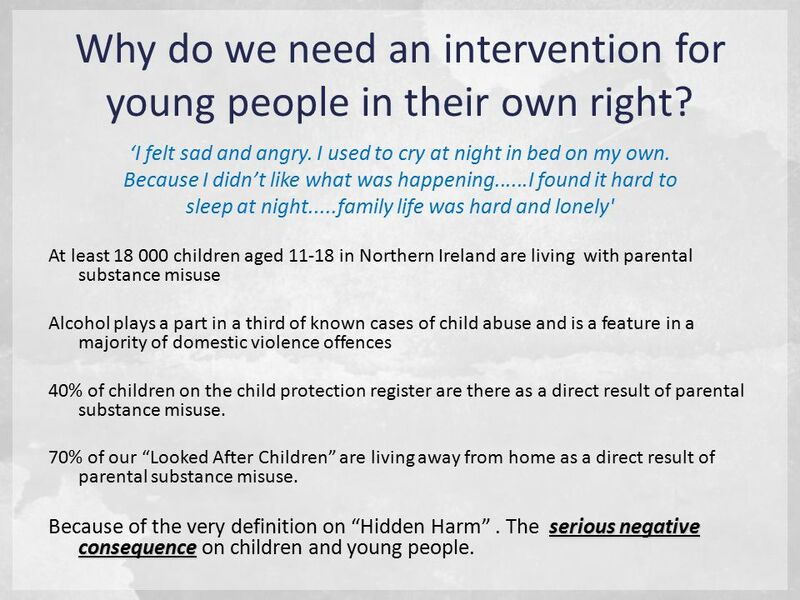 Because I didn’t like what was happening......I found it hard to sleep at night.....family life was hard and lonely' At least 18 000 children aged 11-18 in Northern Ireland are living with parental substance misuse Alcohol plays a part in a third of known cases of child abuse and is a feature in a majority of domestic violence offences 40% of children on the child protection register are there as a direct result of parental substance misuse. 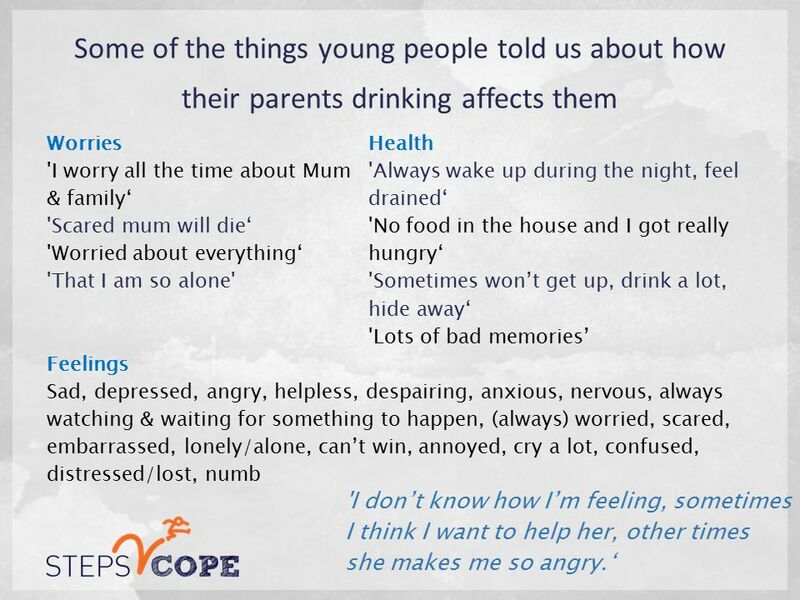 70% of our “Looked After Children” are living away from home as a direct result of parental substance misuse. 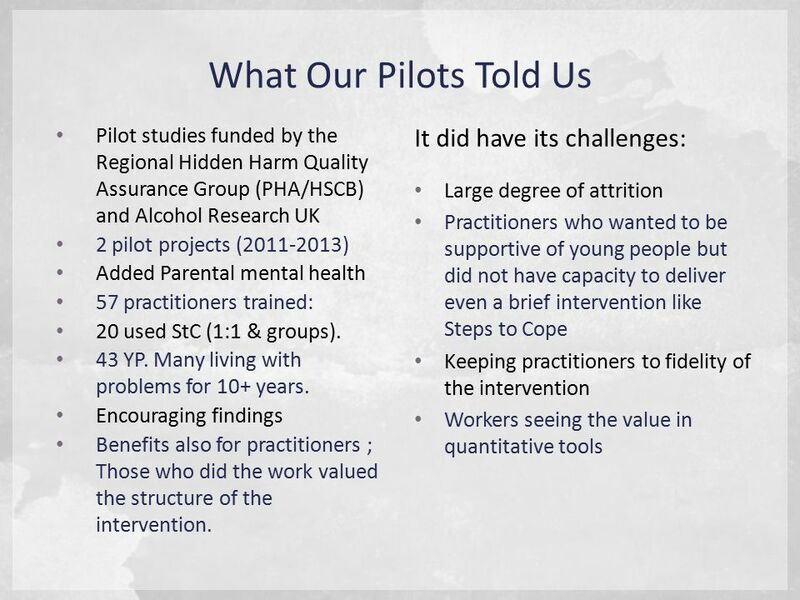 serious negative consequence Because of the very definition on “Hidden Harm”. 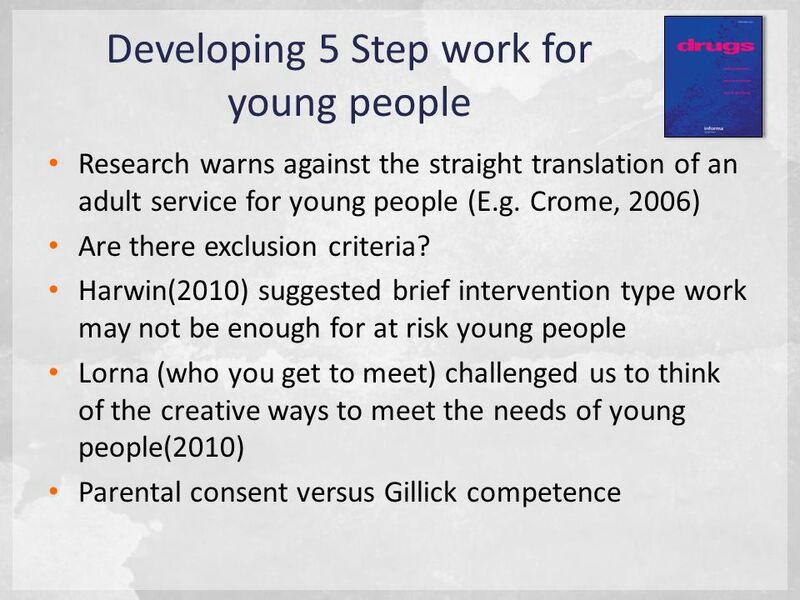 The serious negative consequence on children and young people. 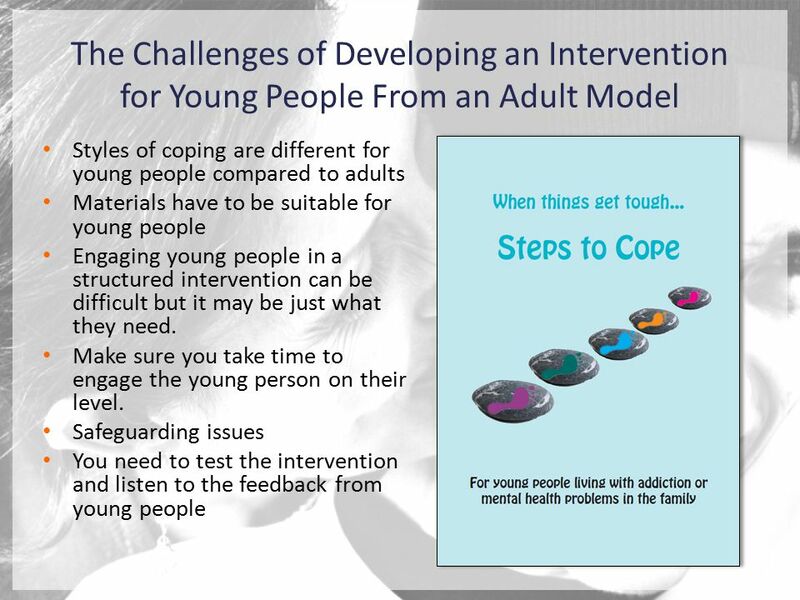 Why do we need an intervention for young people in their own right? 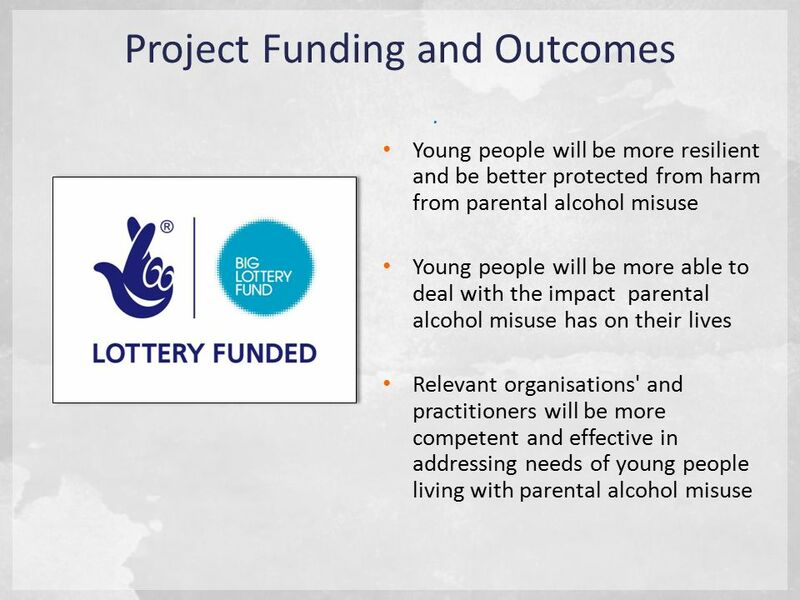 13 Project Funding and Outcomes Young people will be more resilient and be better protected from harm from parental alcohol misuse Young people will be more able to deal with the impact parental alcohol misuse has on their lives Relevant organisations' and practitioners will be more competent and effective in addressing needs of young people living with parental alcohol misuse. 16 Did we get buy-in for the project? 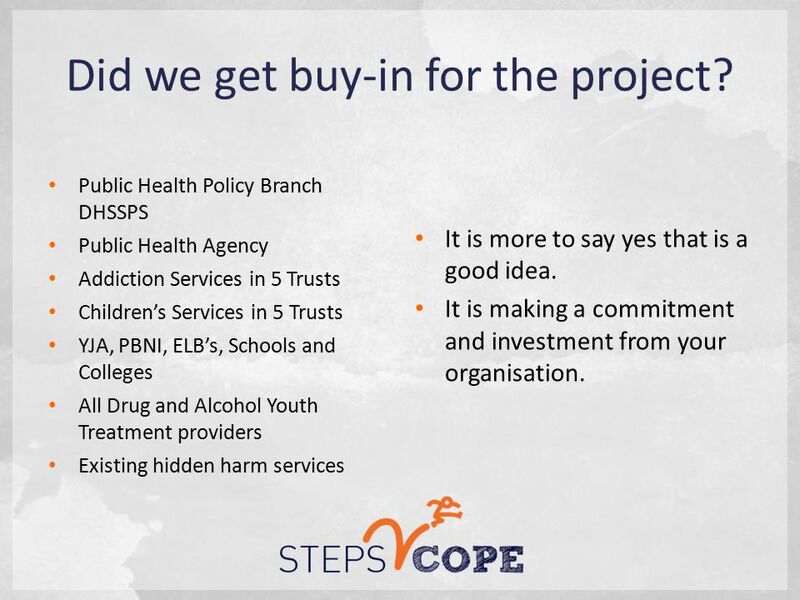 Public Health Policy Branch DHSSPS Public Health Agency Addiction Services in 5 Trusts Children’s Services in 5 Trusts YJA, PBNI, ELB’s, Schools and Colleges All Drug and Alcohol Youth Treatment providers Existing hidden harm services It is more to say yes that is a good idea. 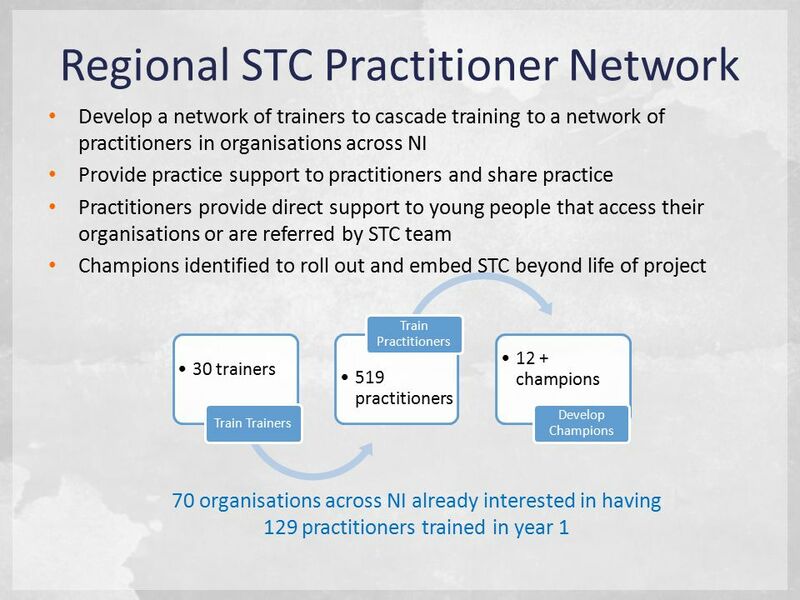 It is making a commitment and investment from your organisation. 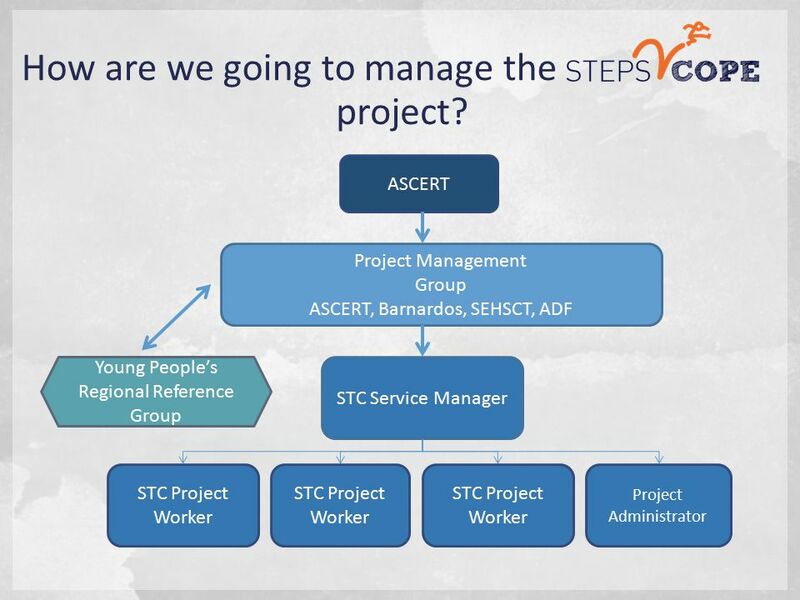 18 How are we going to manage the ASCERT STC Service Manager STC Project Worker Project Administrator STC Project Worker Project Management Group ASCERT, Barnardos, SEHSCT, ADF Young People’s Regional Reference Group project? 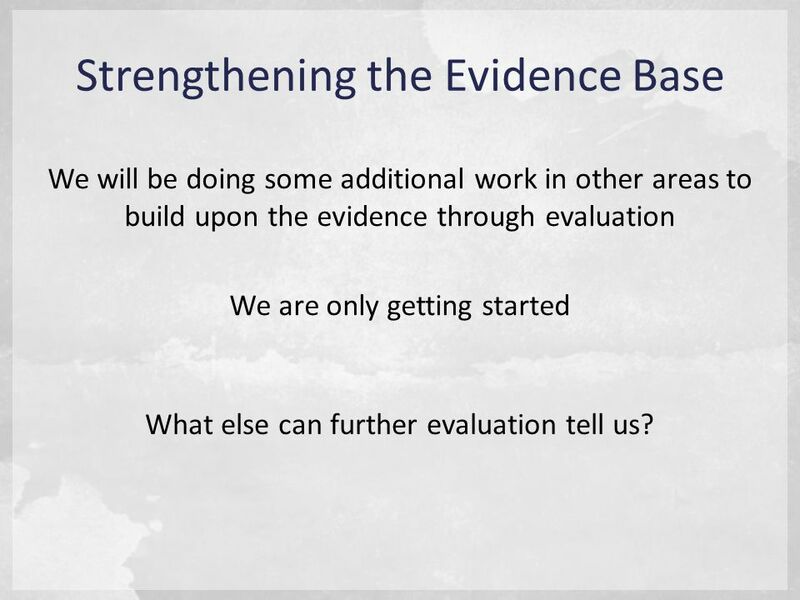 27 Strengthening the Evidence Base We will be doing some additional work in other areas to build upon the evidence through evaluation We are only getting started What else can further evaluation tell us? 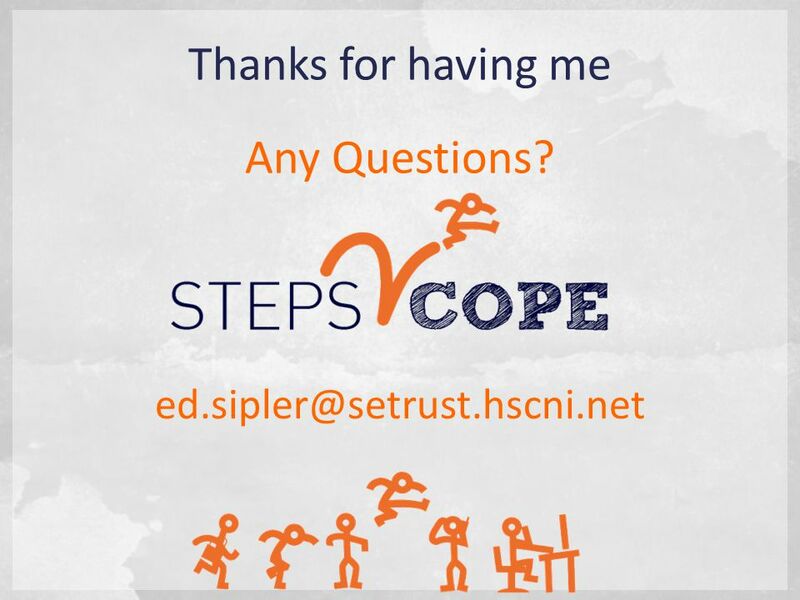 31 ed.sipler@setrust.hscni.net Thanks for having me Any Questions? 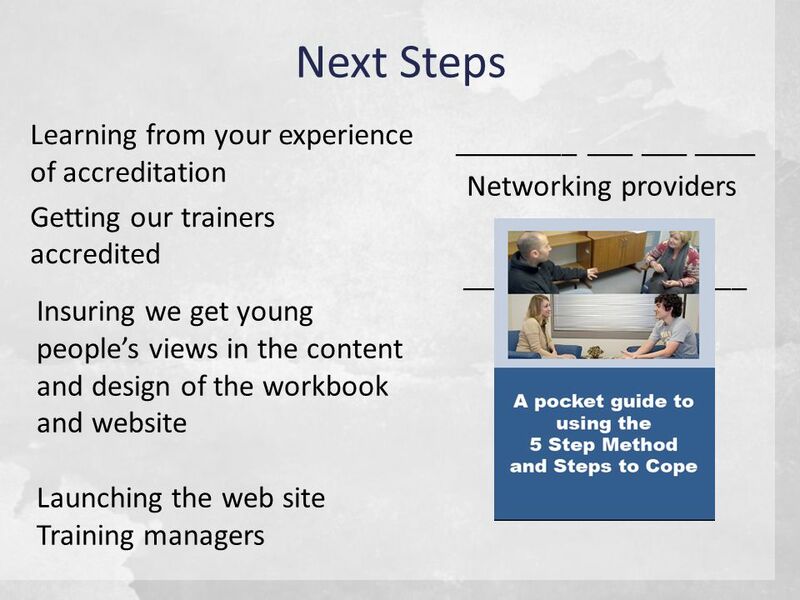 Download ppt "The Opportunities and Challenges Ed Sipler 11/11/14 Adapting an Adult Model for Children and Young People." 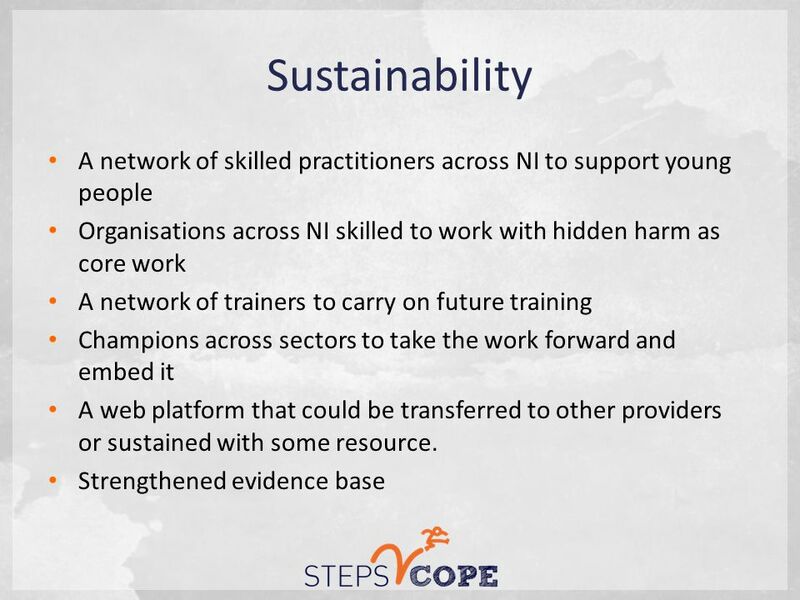 Work-based Learning in the Public Sector: 4 th Nov Working Together: The Common Core Delphine Garr Workforce Development & Learning Manager Alexandra. 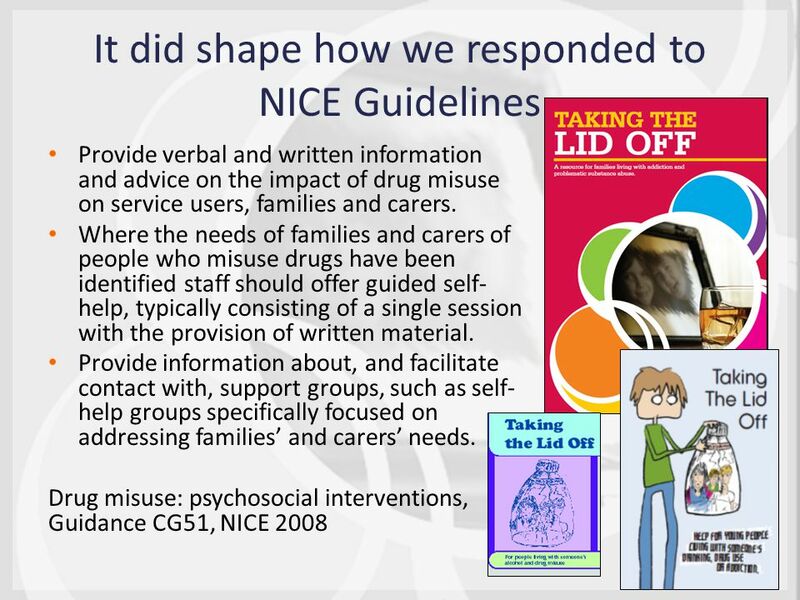 Implementing an alcohol referral pathway The experience of an ambulance service Cathryn James/ Tom Heywood. 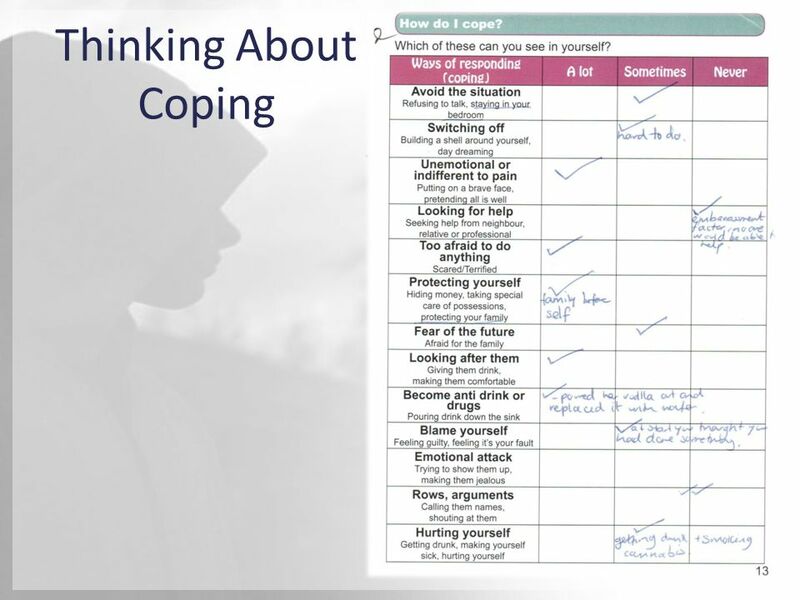 Mental Health Week Introduction W e are here today to help you understand more about what gets you down and hopefully find a few ways to help. This. Wish upon a Star Ross Shire Women’s Aid 2010. Children’s Services Select Committee 5 March 2014 Child Sexual Exploitation Elaine Ryan Safeguarding Lead for Education March 2014. 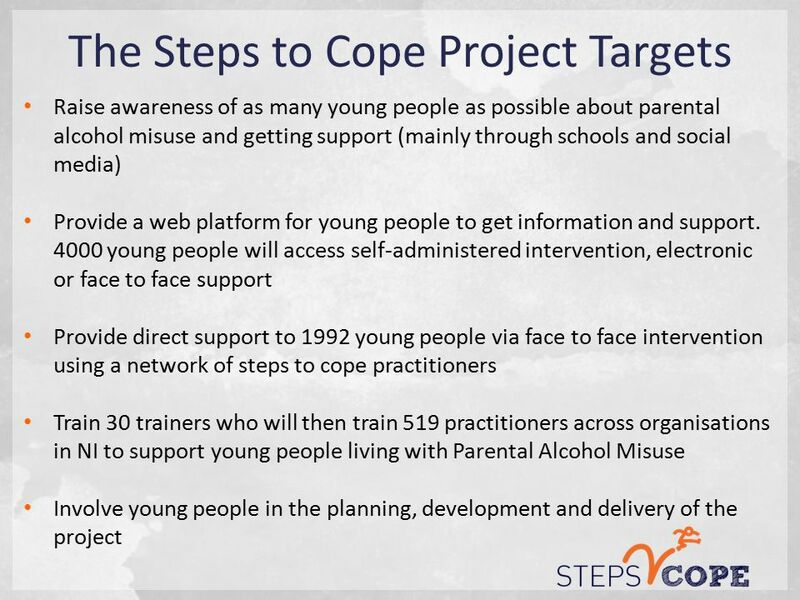 UNTOLD DAMAGE Children’s accounts of living with harmful parental drinking Collaborative research SHAAP/ ChildLine in Scotland to explore what children. 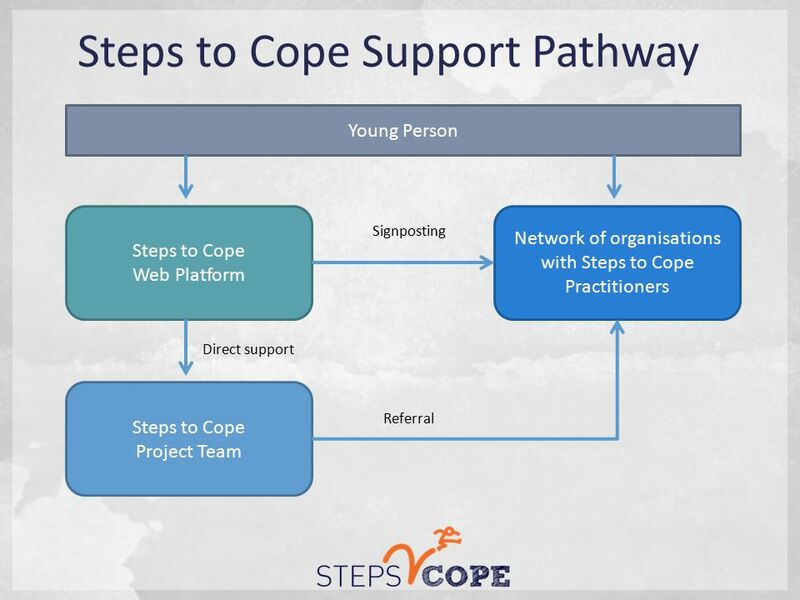 Integrating Children and Young Peoples Services Will Greenhow - Home Affairs David Killip - Health and Social Security John Cain - Department of Education. 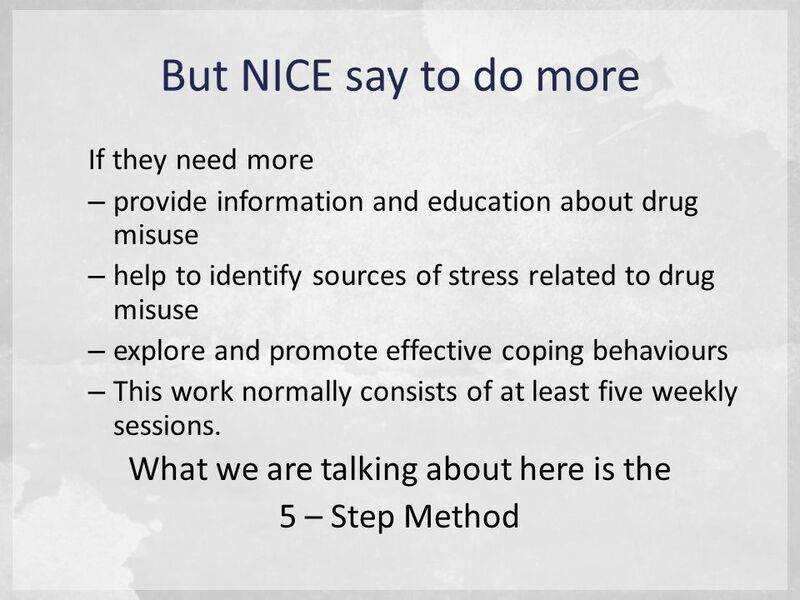 An Interagency Model of Service Delivery- Getting It right for Children affected by parental substance misuse. 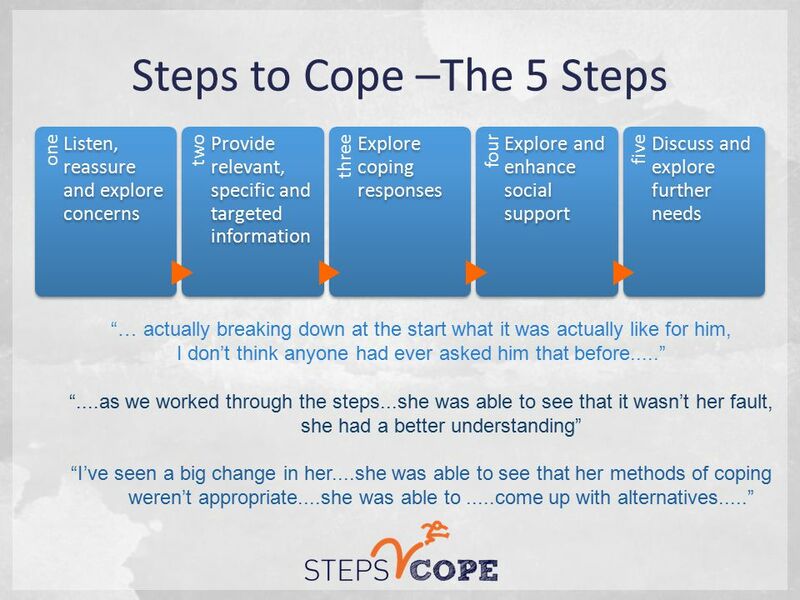 Factors affecting carers’ acceptance and use of support Dr Katherine Pollard Professor Pam Moule Dr Rennie Thompson. 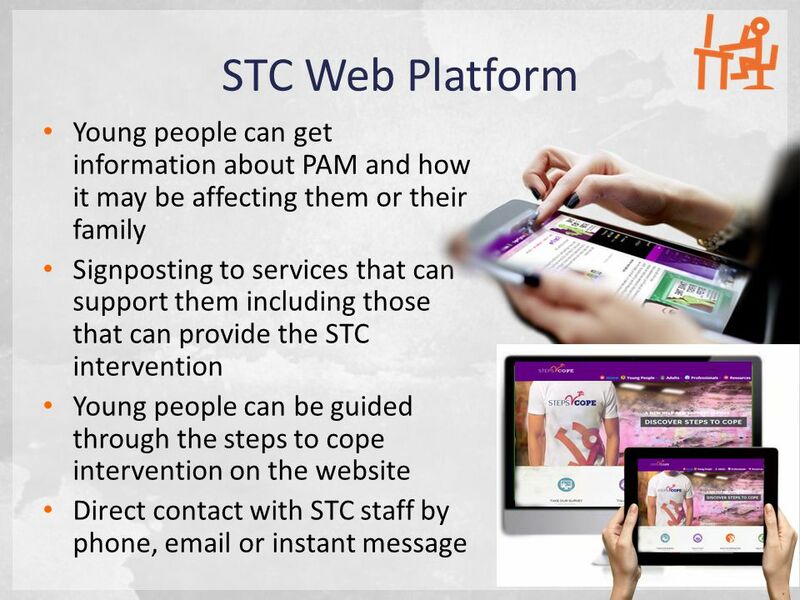 The Children’s Society - Include Programme Whole Family Working Lloyd Meredith-Chapman, Development Worker The Children’s Society Include Programme September. 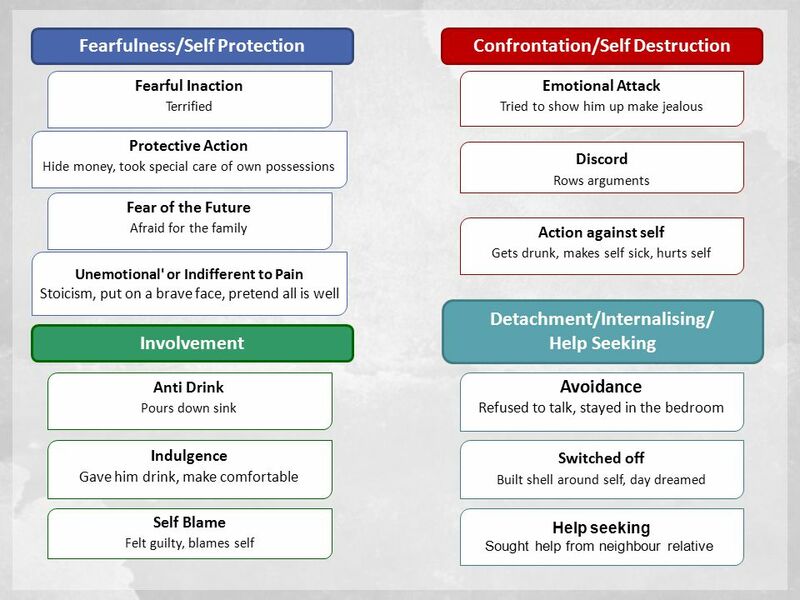 Telling lies * Things to think about * What are lies? A Better Start A Better Future for the Children of Blackpool. 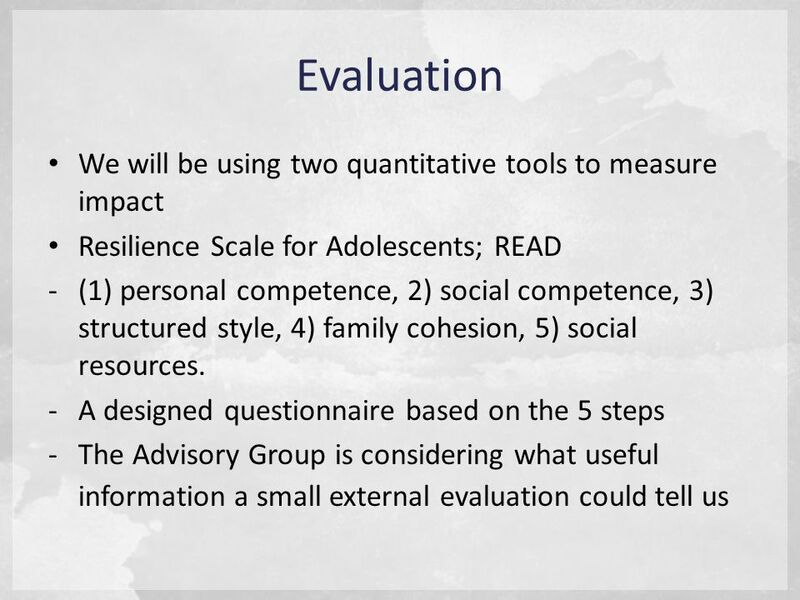 Introduction to Strengthening Families: An Effective Approach to Supporting Families Massachusetts Home Visiting Initiative A Department of Public Health. 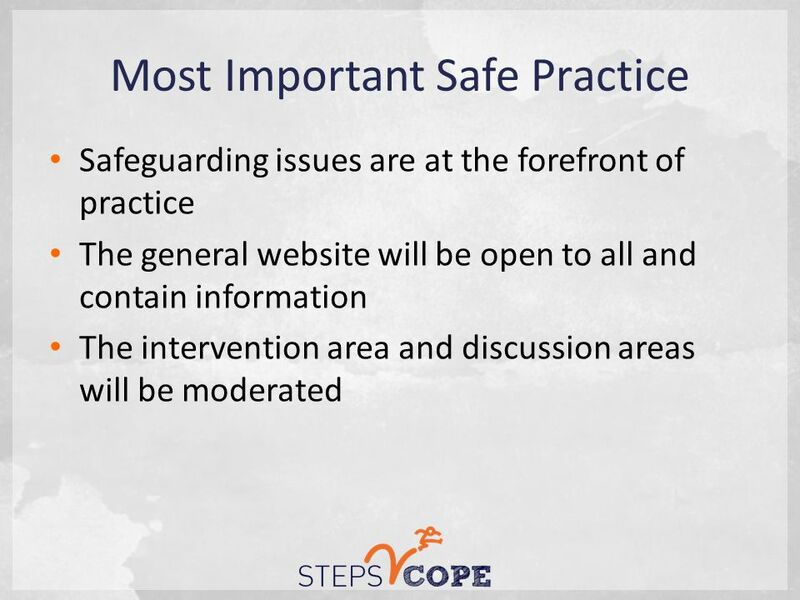  Learning Objectives  To understand that everyone has worries and problems  To find out who you can ask for help  To find out about ways to stay healthy.